Learn how to maximize training gains with Tudor O. Bompa, the pioneer of periodization training, and Carlo A. Buzzichelli, one of the world.s foremost experts on training methods, in the sixth edition of Periodization: Theory and Methodology of Training. Guided by the authors. expertise, the sixth edition offers information central to understanding the latest research and practices related to training theory while providing scientific support for the fundamental principles of periodization. ...The sixth edition of this definitive text presents a comprehensive discussion of periodization based on the philosophy of Tudor Bompa. ...In addition to applying periodization models to resistance training, Periodization also discusses sport-specific endurance. You.ll be introduced to different methods of testing and developing endurance, including the physiological basis for each method. ...Instructors will also find a newly added image bank, allowing access to tables and figures in the text for use when creating lecture materials. 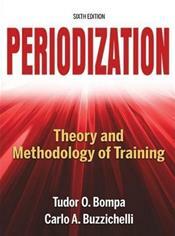 ...Periodization: Theory and Methodology of Training presents the latest refinements to Bompa.s theories on periodization to help you create training programs that enhance sport skills and ensure peak performance.